Photo courtesy of D. Hildebrand. – What would you like to eat, Sir? What’s in an ages? Young, adult , and old? What puzzles me the most about this is that the Chinese seems to correspond mostly to the Engrish. Do not eat do not know = This food makes you wiser. Especially after the forst time. Customer: Waiter. What is your name? Customer:WHAT IS YOUR F—— NAME!!! Waiter: HOO MEE YOU DEAF ROUND-EYED PLICK! “Do not eat do not know” in Texas we call that “road kill”. Speciality of the Fook Yu takeway restaurant. Do you have low-fat eat eat? – Would you like something to eat, Sir? I would never eat anyone I did not know well. If you ate “Food For Thought” with “Do Not Eat Do Not Know,” would they cancel each other out? “Eat forget”? So that’s why Chinese food leaves you hungry again in a half hour. I’ll have the Kung Prozac Chicken, please. Last time I had the Eat Forget meal…but I don’t remember if I liked it or not! Ends up “Blame me not”. It must be one of those incontinence stores. Ah, another storm of word wreckage from the Glories of Google Translation. Buy it once, blame on me. Buy it twice, blame on you. Gosh, faulty wiring, just because you get in first doesn’t mean you have to use them all! Damn! If you cook “Moderate Hardness” long enough with some “Sweet and Delicious”, would it become soft? 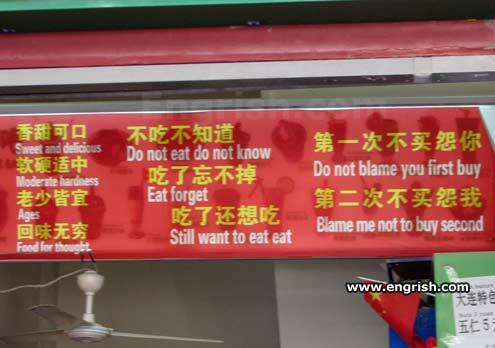 Do not eat, do not tell. So, should I eat or shouldn’t I? Now, that’s food for thought! Even the Chinese words are incomprehensible……. Some eat to forget, some forget to eat. At this place, you’re lucky if you forget to eat. Wait-staff not English speak here. if they do, they’ll forget anyway. Why are the rating buttons of some of the captions above greyed out when I haven’t rated any? This explains all the politicians who eat here …. I’ll have a Cafe Vodka Valium Latte to go please. If you don’t buy it the second time, blame me. What a masterwork! Du Fu and Su Dongpo would turn green from envy! Photo taken in the McDonald’s next to the Zen monastery.